After giving up a goal in the tenth minute, the Union came back to win against Dallas in stoppage time. Local, Texan, and “national” coverage. Bedoya’s stoppage-time game-winner earned him a Goal of the Week nomination. Picault thinks MLS officiating lacks consistency. Bethlehem Steel FC overcame a 3-1 deficit (and a Matt Real red card) to beat Swope Park Rangers in Kansas City. Bethlehem also signed Union Academy forward Shanyder Borgelin. West Chester United beat Boston-based Safira FC 3-0 qualifying WCU for the US Open Cup where they will face a regional opponent. It is the first time the Predators have made the US Open Cup since their 2016 debut. Arjen Robben is considering leaving Bavaria to join MLS. Maybe. LAFC continued it’s unbeaten streak by travelling to DC and beating United 4-0. 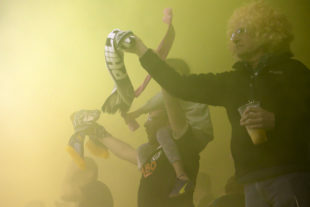 Minnesota United proved that they have to be taken seriously this year, beating the Red Bulls 2-1 before heading back to St. Paul to open Allianz Field against NYCFC next weekend. Nani finally scored for the Lions, then scored a PK as Orlando City beat the Colorado Rapids 4-3. A stoppable force met a movable object as San Jose met Portland and beat them 3-0. This gave the Quakes their first win of the season, and secured the Timbers position at the bottom of the standings with just one point in 2019. Columbus got a first half goal, and New England saw red early in the second half, making for an easy 1-0 victory for the Crew. Felipe Martins isn’t happy about Vancouver fans cheering for Zlatan. A tribute to the ’99ers added interest to what would have been a hard to watch one-sided USWNT victory against overmatched Belgium. ESPN announced that it will be streaming every game of the 2019 US Open Cup on their ESPN+ service, giving the tournament a much-needed boost in visibility. Tim Weah had a good weekend in Scotland. The Canadian Premier League revealed all of it’s inaugural-season jerseys. Notice how not a single one of them is a plain white tee with lick-and-stick crest and sponsor logos? Mo Salah took fewer games to reach fifty goals than any other Liverpool player. Diego Costa lost his mind. Don’t think I’m happy about the US Open Cup being streamed on a pay service when in the past it’s been free on the Union website (not that it mattered last year since all but the finals were at Talen so I was at the games). Field at Talen wasn’t much better Saturday night than what is in that clip from the Bronx. I’d rather it not be behind a paywall, too. Probably better than being buried on BeIn or wherever it was before. ESPN+ passed 2 million subscribers….not much of the total pop. but better than a lot of these services. I was wondering about the pitch while watching Saturday. I don’t know I h about the grass types, but the team switched this year right? The field looked more like my yard than a pro field, very dark and pulling up. Is this common? Is the new grsss type better overall eventually? They definitely replaced it over the winter. I heard rumors that it is supposed to get better as it gets warmer, but so far it has not been good. the pitch at Talen compared very poorly to that at Sporting KC where Bethlehem played Saturday evening. Children’s Mercy park looked like a putting green. Coach Burke commented on it’s quality in his preview comments. The announcers said the field is headed and has grow lights, as well as a grass type designed for the latitude. Play was stopped briefly at Talen Sturday night for a groundskeeper to step on and replace a particularly horrendous divot. They did a hole new re-soding…if that’s the correct term. I really think Mother nature hasn’t been cooperative. Very wet and not a lot of sun. I’m hoping it starts putting roots into the ground soon! Before they had Bermuda grass. Any idea what type of grass they now have? Looks like Latitude 36 Bermuda grass. At least that is what the vendor installed for the training surface. Assuming they would want the same surfaces for both training and stadium? That Dallas version of the game seems a bit upset about all of the players missing. They were winning until they tackled a player in box, and they were tied in extra time. I’m not sure how much of a difference the suspended players would have changed the game. The Union had (again) a ton of shots on goal that didn’t go in. If we play the “what-if” game, we can start there. I always like to wait until there are 6 games completed before setting real expectations. And with 6 games gone, I think we have a real reason to be optimistic about this team. I’m not sure they are Shield or Cup winners yet, but they can at least be on the fringes of those discussions for a few months if they can keep up this level of play. Jim’s doing a great job so far. And with all of these weapons at his disposal, he seems to be using them correctly. And Monteiro is a fantastic Swiss Army Knife of a player. The challenge awaiting Jim is rotations so you don’t burn out players. Start Monterio in place of Haris occasionally, or on the left, with Aaronson moving to the 10 to give Fabian a break. Something to keep legs fresh as the season goes on. But so far, so good. It’s fun again at Talen. A six-game window for an early assessment is a good testament to your handle. Practical. The opposite of the many, many odes I heard this week to DC United being the best team in the East on the back of three games and before they were given a 4-0 drubbing. I know, Rooney was sent off, but let’s give ’em a few more matches before crowning them conference champs. It does look like we might have a proper team on our hands. I’ve said before that it is against the laws of nature and my timeshare at the Cliff of Union Despair to be optimistic about this team. But damn, I am starting to get optimistic about this team. We went from “who can play in the midfield?” to “how do we keep all these good midfielders on the bench?” in a flash thanks to the Monteiro signing, the lightning emergence of Aaronson, and the re-emergence of Medunjanin. We have depth at center back too. 1. Goal scoring. We’re getting a lot of scoring from the midfield. If Accam goes cold, it is not clear that another striker can/will step up. Can we keep getting enough goals from Fabiàn, Aaronson, Ilsinho et al to win matches? 2. Squad rotation. Jim Curtin just had probably his best match ever as a coach. Now it’s time for us to see whether he’s learned the art of squad rotation. If not, then Medunjanin and Bedoya (and maybe even some of the younger guys) are gonna wear down by August. 3. Kai Wagner injury. He’s the most irreplaceable guy on the squad right now. If he gets injured, teams are gonna run rampant on both flanks and we might be in trouble defensively. Wow what a win, still feeling it. If Reto Ziegler doesn’t get at least a two game suspension, I’ll be shocked as this isn’t his first time kicking an opponent. How that play wasn’t reviewed is beyond me after Fabián’s red card on a review that looked less deliberate. Santos scoring in extra-time for Bethlehem is a good sign as he came on as a sub and played over thirty minutes and made an impact. Wagner is a machine but I thought Ray had one of his better games defensively. Overall the defence is starting to gel nicely with Medunjanin looking like he’s figured out his role with the two center-mids. At this point in the season, the only team that looks unstoppable is LAFC and maybe Seattle. After that, it looks wide open especially in the East. particularly considering Marco Fabian was ridiculously penalized for a far more lenient version of dirty. Great year to be a season ticket holder. Can’t remember a year having so much fun! Hope the fun continues!